If you’ve been around children’s sports in the last ten or fifteen years, you might have noticed a strange trend, there is no score-keeping. Kids battle it out for an hour, but in the end there are no winners or losers. Everyone walks off the field or court “equal”. Or take the modern American classroom. Many schools have stopped using the traditional A-F grading scale. Instead, they give children a grade of “pass” or “fail”. That means the A student and the C student both get the same grade. So why have we shielded our children from experiencing losing the game or getting a “C” in math? Self-esteem. We don’t want our children to feel badly about themselves. In fact, that is how our society has defined it. Self-esteem is feeling good about you and what you can achieve. We read books about how to have it. We go to therapy or take medications if we don’t (I am not talking about clinical depression!). You would think in the richest, most free country in the world we would have more self-esteem than anyone else in history. However, there has been a 400% increase in the use of anti-depressants from 1988-2008. In fact, 1 out of 10 Americans age 12 and older take them, and less than 1/3 of people on anti-depressants have actually seen a mental health professional in the last year (Harvard Health Letter, October 20, 2011). While one could argue a lot of reasons for an increase in the use of anti-depressants, I believe our culture has defined self-esteem and the basis for it incorrectly. We need to change our definition to what God requires. God does not expect us to feel good about ourselves; He expects us to feel right about ourselves. Most of the time feeling right about ourselves should lead us to positive thoughts, but sometimes feeling right about ourselves should lead us to repentance. Our self-worth in God’s eyes should be the basis of our self-esteem as Christian women. Let’s compare worldly self-esteem to God’s view of self-esteem. First, self-esteem should be exemplified by a consistency in thought. Notice I didn’t say a consistency in feeling. As humans, and women especially, our feelings are not a Biblical standard. In Jeremiah 17:9 it says, “The heart is deceitful above all things, and desperately sick; who can understand it?”(ESV). The Hebrew word used for “heart” in this verse can mean our emotions and feelings. Something described as “deceitful” and “desperately sick” in God’s word is not something we want to heed in our lives! Feelings fluctuate from day to day, hour to hour, or even minute to minute. My husband is always amazed by our daughters’ ability to be extremely upset and sobbing one minute, then laughing and smiling the next! If you listen to our culture, it tells you that how you feel about yourself is the most important part of self-esteem, but our feelings will carry our mind and attitudes from highs to lows and back again, day in and day out. We must train our thoughts to anchor our self-esteem so that it is not tossed about by feelings. This is not easy! It requires constant dedication and attention to our moods with Biblical thoughts to counteract feelings. Once you actually spend a day paying attention to the things you say to yourself in your mind, you might be shocked at how much your feelings hurl insults at your self-worth. Second, self-esteem should be focused on others. 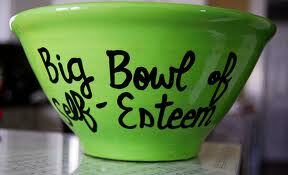 There are two extremes when it comes to self-esteem, those with too much and those with too little. The first group is commonly known as narcissists. These are people who have excessive self-admiration. They are the best. Everything should be focused on them, their abilities, their lives, etc. The second group has low self-esteem. They feel like they can do nothing right. When something goes wrong, it is always their fault. If only they had been prettier, a better mother, a better wife, a better whatever, then xyz wouldn’t have happened. As extreme as these views are, they have one thing in common. It’s all about me! Either I’m the focus because I’m so wonderful or I’m the focus because I’m so awful. Neither of these views is correct or godly. Mary is a narcissist. She doesn’t feel like she should have to do anything for the church unless she gets the starring role and lots of recognition. She is so good at so many things that she always wants to be in charge. She shouldn’t have to help clean up! She organized the entire event. Sandy, on the other hand, suffers from low self-esteem. She doesn’t want to help clean up either. Sandy is always asked to do menial jobs like cleaning up the fellowship hall. She knows it’s just because she doesn’t have any real talents. They always have the people without talent clean, so she does as little as she can. Why does she even come to these things? It just makes her feel bad about herself. Louise has a Biblical view of self-esteem. She enjoys serving in whatever capacity she is asked. She doesn’t necessarily like cleaning, but she does like helping others and the Lord’s kingdom. She knows that she is defined by more than the job she is doing tonight, so she goes about cheerfully doing what needs to be done even if no one thanks her or even notices. Do you see how extremes of self-esteem lead to a selfish heart and ultimately a “me” focused attitude? We have all known women that fall into each of the above categories. Maybe at times we have fallen into all three of those categories. I know I have! But we should find ourselves becoming more and more like Louise and less and less like Mary and Sandy. Finally, as Christians our self-esteem should be found in the cross. This is where the world’s version of self-esteem is most incorrect. The world tells you self esteem is found in externals, looks, children, intelligence, husband, marriage, home, job, etc. But God tells us that our self-esteem is found in the cross and what it represents. If you want to think right about yourself, you have come to the correct place. The cross will tell you that you are worth more than anything else in God’s eyes. You are worth the life of His innocent Son. The cross will tell you that you are undeserving and a sinner. That you still have things to work on that God wants to perfect in you. You are not better than anyone else. You are not worse than anyone else. You are a Christian woman made to serve a God who wants you to realize that you are fabulous, wonderful, and purchased at a great price so that He can make you into what He wants you to be. "God does not expect us to feel good about ourselves; He expects us to feel right about ourselves." Very good!